5 Comments on "Remains of Nazi Officer Discovered inside 100-Year Old Giant Catfish"
YOU CARE MORE FOR THE CATFISH THAN THE FAMILY THAT WILL GET CLOSURE AND A BURIAL FOR THEIR LOVED ONE. I CALL IT A MIRACLE SOMEONE WAS PRAYING FOR. JUST KNOWING WHERE THE BODY OF A LOVED ONE IS AND BEING ABLE TO HAVE THAT FINAL RESTING PLACE IS PRICELESS. PLENTY MORE CATFISH IN THE SEA AND MAYBE ONE OF YOU TWO LADIES WILL BE FORTUNATE ENOUGH TO BE CATFISH FOOD FOR ONE OF THEM WHEN YOU DIE. CREMATION AND ASHES INTO THE SEA OR JUST HAVE YOUR BODY PARTS DISPERSED AT SEA. It’s NOT an SS cap eagle. It’s a Nationalsozialistische Reich-Krieger Bund (NS-RKB) [National Socialist Empire War Association] breast eagle. So it’s very unlikely that the remains are that of an SS man. That’s a baby comparative to the one recently caught in The Father of Waters Mississippi River weighing in at 736 pounds and 170 years old. Don’t you think that after over 50 years all that stuff would’ve left the fish’s body by now? Just a thought, not sure, but just a thought. 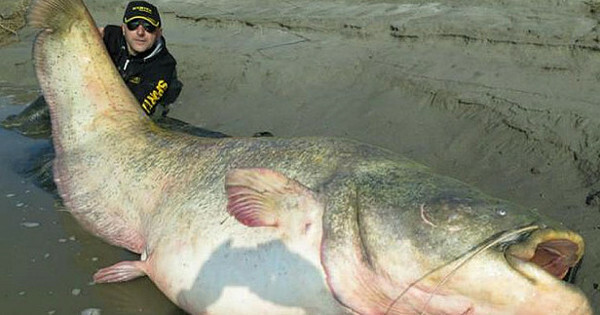 A while back I caught a cat fish slightly bigger than this one caught in Poland, but it got away.